Miriel is an ordinary girl with extraordinary talents ready to help the townspeople with their needs. In Miriel the Magical Merchant, help her pay off an enormous family debt by serving customers using her magical powers. In Miriel's Enchanted Mystery, follow along as Miriel continues running the family mercantile while tracking down the source and power of a mysterious magical egg. Both of these wonderful challenges offer hours of enchanted evenings in a fantastical medieval setting. 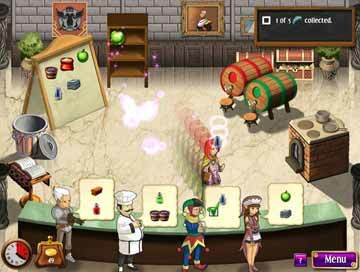 Bake delicious goods, concoct helpful potions, and unlock recipes that you can make for yourself. Also offering multiple endings as well as Hidden Object and Match 3 mini-games, this is one magical duo you can't pass up. When you go to a restaurant do you ever wonder what really happens in the kitchen and how does the food get prepared. Sure everybody knows how the food is prepared in their home and they presume it is the same or similar way the chefs do in their kitchen, but in Miriel’s kitchen the things aren’t as nearly similar as the way we know how to prepare food. Miriel’s Enchanted Double Pack offers a ‘course’ that will be too big of a bite for any fan of the time management series. One of the two games is a treat for itself, but both of them are a definite winner and a must have especially if you haven’t had the pleasure of playing this game. 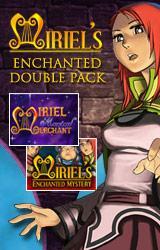 The first game in the double pack is Miriel the Magical Merchant. In Miriel’s kitchen everything is done in a way that you will get quickly fond of. The kitchen for Miriel is her families’ legacy, but besides that legacy as an addition she got a huge debt that she must pay. As it is the only income she has and needs in her life, especially in the situation she is in. The game is set in a theme from the medieval age where Vikings, swordsman, magicians, royalty and all other characters were the recognition icons of that time, but all of them are also your customers. Miriel does all of her cooking with magic and every ingredient she needs she conjures and then starts her cooking. The games story interludes you in the game, but it is up to you to decide what happens next as the game is created in a way that the choices that you make have different effect on the complete outcome of the stories ending, that is it is up to you to decide whether the story will end with you turning good or evil. The in-game food ingredients are also fairly typical of the middle ages, including items like bread, cheese, milk, apples, cake, eggs, and pails of water. 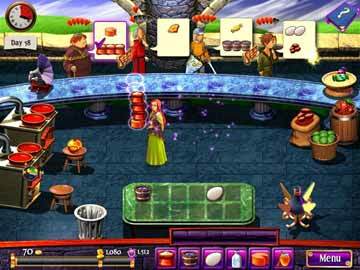 The gameplay is very simple and quite familiar to the players who have played other cooking games like Cooking Dash and Mystic Inn or any cooking game for that matter but this one is with spiced up with a pinch of magic. As the customers appear in the shop they will give you different orders of meals that they want to be prepared for them. Depending on the order and the difficulty of its making you will have it cooked up in a second or more than a couple of seconds. The ingredients that Mirirel uses, even though they are created magically or ordered they can’t appear every time you want them to, just like that. For the ingredients to appear after you already ordered them, a certain period of time must pass for it to be ordered again. That’s when strategy gets very involved in the game, and the planning starts. At the beginning Miriel can carry only two items by her side, but as the game advances and evolves do does her capacity for carrying more items with her. At the beginning the customers will have simple demands in their orders, but those demands will become more and more complex and the combination of different ingredients will become a standard case after a while. You will be combining eggs, flour, milk, water, apples and some of the special items like strawberries. You will choose the two items you think you need to combine, put them in the oven and ‘presto’ you have a new product. There are nineteen different combinations that you can get out of the oven, and as most of the meals that are cooked or baked, they are best served hot. When the product is finished it then appears besides the oven after which you have a couple of seconds to serve it if you wish to get a golden wing for serving it fast. Collecting these wings will fuel the “haste device” and power it up. This haste device is pretty useful, and speeds up Miriel substantially when activated. Like the beginning of the story explains, you need cash and you have to earn it by selling your products, but it’s not as easy as it sounds. Every customer that comes has a patience level for which he or she is willing to wait for its order. If you pass the time predicted for waiting the customer will leave the shop without paying and the worst part is you will lose rating for that level. The customers that are served in time will leave the money on the counter but you have to pick it up personally or the money will disappear after a short period of time. The beauty of the game is definitely its graphics. Almost every single detail of the game is very nicely animated and the music and the sound contribute making the additional effect of that little world of baking through magic. As for the mini-games that are given in between the games to break up the game flow a bit, they are all match 3 games. The recipes that are given in the game are very ingenuous used, as you can use those recipes in the real life, making it a nice addition for those who like to work with flour and cooking for that matter. The game is done in such a way that playing it again is always an option as the multiple choices that you select during the game can always be changes and the recipes that you used can only be remembered if you have photographic memory. 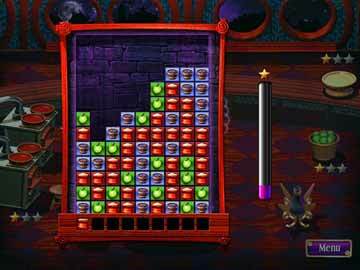 The game is no piece of cake at all, even though you can make a cake here, but the possible combinations will catch you of guard several times adding much to the challenge of the game. As for the sequel to the game Miriel's Enchanted Mystery, on the first look people could think you have almost the same game to play but that’s not true at all. In this part Miriel is visiting her grandmother, and as some people are workaholics like Miriel, she opens another shop in Heremoor where she is currently. Since Miriel studied magic, her grandmother asks her to examine a large, strange, rune-covered egg that appeared in the kind old lady's garden. All of the game is spinning around this egg, but you just can’t open it anyway you try, at least not alone… there is someone in the town that can help you, but that person has specific demands in ingredient’s that he wants and items which you also must look all over the town for him. Basically the gameplay stays the same as for the paying and making the products, but with a slights cutback with the recipes unlike in the first part. This has been made to simplify the gameplay a bit which kind is a good thing as the slight decrease of difficulty is what the game needed. As you might have guessed from the text above the mini-games have been changed with HOG instead of match 3. The gold or the cash that you earn has now additional appliance, by buying from a travel merchant. You can buy new ingredients, recipes, spells, or machines for your shops giving it new life and new content to the game, especially with the spells. These spells are a very nice feature, and, while also making the game even more intense, they provide really helpful bonus skills and enable various strategies. These are similar to the golden wings and the haste machine option in the first part. But the big setback was definitely the fact if you want to win the expert time, you don’t get a chance to replay the level if you fail, unless you start the game all over again… The game has replay ability within itself but probably not in this extent. The graphics and the audio are as in the first part, quite impressing, and adding the additionally pampered story you get a combination that you can’t avoid just like that! The combination of these two games is simply great and not playing this game is a great loss for any time management fan.